Is collection management still needed? What is a collection development policy? Why have a collection development policy? What should a collection development policy contain? A separate collection development policy for digital resources? What does acquisitions work involve? The rapidly increasing reliance on digital rather than print-based resources has not diminished the importance of library collection management, but it has required significant modification in the thinking and the practice of collection managers, who today usually have to consider their clients' need for both print-based and digital materials. 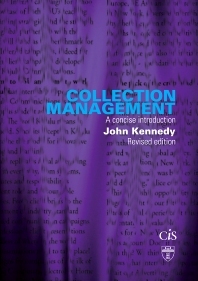 This updated edition aims to provide a concise overview of the major elements of contemporary collection management of print and digital resources - including policy formulation, selection, acquisition, evaluation, preservation, deselection, and cooperative collecting - in a way which aims to be of interest to the student and to any other reader seeking an understanding of a particularly dynamic area of librarianship. Much that has been previously published on collection management focuses on academic libraries, particularly those in North America. This book places greater emphasis on the experiences of smaller public and special libraries, and attempts to view its subject from the perspective of libraries in Australia and other countries geographically remote from North America and Western Europe. Dr John Kennedy has taught collection management at Charles Sturt University for over a decade and has produced several previous publications on the subject.